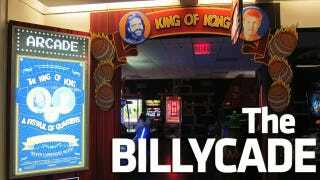 Billy Mitchell, who supplied every villainous stereotype short of twirling his mustache in "The King of Kong: A Fistful of Quarters," has opened an arcade at Orlando's airport under the film's branding - with good guy Steve Wiebe gracing the entrance. The King of Kong branding on Mitchell's arcade probably means everyone's aboard with it, which means the Mitchell-Wiebe rivalry has evolved into some kind of amicable relationship. As well it should, the two are more famous together, thanks to the 2007 documentary, which made Wiebe the face and Mitchell the heel, than they are apart. Notably, Mitchell's arcade does not have a Donkey Kong machine - perhaps to keep someone (Hank Chien?) from beating the record in his own establishment. Others have complained about the arcade's lack of classic titles. Thematically, there should be all the 1980s arcade hits in there. But this is an airport business appealing to folks who may have never seen the movie. Newer machines bring in more money. Mitchell's arcade, as you can see in this video, features a couple of Dead Heat cabinets, Terminator Salvation, two Super Bikes 1 setups, an Avatar pinball machine, plus an air hockey table and Aliens Extermination. Next time you fly to Orlando International Airport - it's the home of Disney World, and a hub for AirTran - check it out.